Ray Bradbury brings wonders alive. 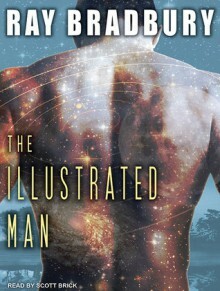 A peerless American storyteller, his oeuvre has been celebrated for decades—from the Martian Chronicles and Fahrenheit 451 to Dandelion Wine and Something Wicked This Way Comes.The Illustrated Man is classic Bradbury—a collection of tales that breathe and move, animated by sharp, intaken breath and flexing muscle. Here are eighteen startling visions as keen as the tattooist's needle and as colorful as the inks that indelibly stain the body.The images, ideas, sounds, and scents that abound in this phantasmagoric sideshow are provocative and powerful: the mournful cries of celestial travelers cast out cruelly into a vast, empty space of stars and blackness; the sight of grey dust settling over a forgotten outpost on a road that leads nowhere; the pungent odor of Jupiter on a returning father's clothing. Here living cities take their vengeance, technology awakens the most primal natural instincts, Martian invasions are foiled by the good life and the glad hand, and dreams are carried aloft in junkyard rockets.Bradbury's The Illustrated Man is a kaleidoscopic blending of magic, imagination, and truth, widely believed to be one of the grandmaster's premier accomplishments: as exhilarating as interplanetary travel, as maddening as a walk in a million-year rain, and as comforting as simple, familiar rituals on the last night of the world.The stories contained in The Illustrated Man are "Prologue: The Illustrated Man," "The Veldt," "Kaleidoscope," "The Other Foot," "The Highway," "The Man," "The Long Rain," "The Rocket Man," "The Last Night of the World," "The Exiles," "No Particular Night or Morning," "The Fox and the Forest," "The Visitor," "The Concrete Mixer," "Marionettes, Inc. ," "The City," "Zero Hour," "The Rocket," and "The Illustrated Man."